According to Felix, the term 'participant experience design' is a work in progress. It was established based on the theory of meeting design, a well-known 'tool kit' used by planners worldwide. 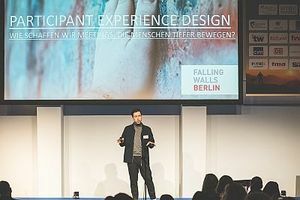 The participant experience design adds practical examples regarding how to apply all these tools to your events, with the Falling Walls conference being used as a case study. 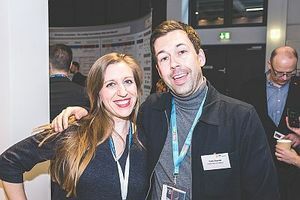 According to Felix, one aspect that came to light from discussions with event planners globally is that the industry is moving away from the 'old world' to the 'new world' of meetings, conferences and incentives. There is critique towards 'we've been always doing the same, we have the same formats, introductions are too long, sessions are too long'. Therefore, we need new event formats that require organisers to be braver and more risk tolerant to transition to the 'new world' of meetings and events. The Falling Walls conference achieves this aim by putting humans into focus. Event organisers understand the needs, motivations and hopes of their participants and what effect the conference has on the individual. That knowledge helps the organisers to define the purpose of the conference. More on the importance of purpose in the following paragraphs. The Falling Walls conference first took place in 2009 and now occurs yearly on the day of the fall of the Berlin Wall - 9 November. It's a scientific conference and its aim is to bridge the gap between science and society, build international networks, address world challenges and search for solutions. The fall of the Berlin wall is associated with a certain emotion for individuals, but it also has a symbolic meaning. Today, there are other walls, old walls that still exist, and new walls are being built. These are not physical walls, but also metaphoric ones which we need to tear down: climate change, epidemics, poverty, modern slavery, inequality worldwide. These problems must be addressed as a society, and we can achieve this aim by bringing the brightest minds together to find solutions and introduce regulations (e.g., ethics of artificial intelligence (AI)). Event attendees who are present at a conference over several years develop a sense of belonging and identity which can be attributed to being part of a community, group or tribe. Here, event organisers can encourage it or ignore it. And it is here where the purpose is key and must be defined from the get-go. Organisers must answer the questions: What do we want to achieve with the event? Do we want to create connections? Why do we want to do it? Through these questions we come to the next level - which is the purpose. The next stage is to apply purpose to experiences. Here, Felix used the example of the inverted iceberg experience process - the work that goes under the iceberg is not seen by the participants but that's where the emphasis is to establish the basis to come to the purpose, and then to the goals. Transitioning to the new event world: What can a meeting look like? Can a meeting be similar to a concert of your favourite music band and how can this experience be applied to a business event? Can a meeting be like a dinner among friends, when time stands still while having candid discussions in a cosy atmosphere? Can a meeting be equated to an inspirational art experience, when attendees are overwhelmed and intellectually stimulated, and that leaves a lasting impression on an individual? Inspiration is the main currency here. When people let themselves be deeply motivated and want to actively take part in an event, they express curiosity and proactively approach other delegates. These elements - curiosity, openness, flow and willingness to learn - can be planned with the methods of 'meeting design.' But how? Firstly, organisers must recognise participants' needs, starting with the basic requirements, such as no waiting time and long queuing and from there go up the pyramid and understand the deeper needs of self-actualisation and purpose, considered to be 'the highest level' of needs. 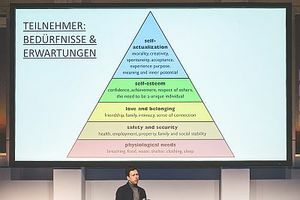 The Falling Walls conference incorporates these elements, putting the 'human' at the centre, to help attendees fulfil their needs on the highest level of the pyramid - self-actualisation. For example, the catering was prepared by Ibrahim from Egypt, who chose the menu, cooked and served the food. The choice of dishes had a special meaning for him because he chose food that reminds him of his family in Egypt, who he hasn't seen for four years. Conference organisers had asked him to cook food that evokes emotional memories for him, and all 800 delegates know that, so when they approached him, they could share memories and emotions with him. On the surface it's a very basic function - to get food. Under the surface, there is a deeper emotional aspect. Another example is a demonstration organised by the Falling Walls conference in Berlin. This event was organised to fulfil political needs, those on a higher level, at the top of the pyramid, of world leaders in science. There is a pride in this community, creating a stronger sense of belonging to carry out this demonstration together, which would not have been possible to do alone. The experience journey mapping is a tool for organisers to analyse how delegates go through the 'event journey'. Here, event organisers should recognise key moments at the event. For example, at the beginning of the conference, organisers must provide people with security, comfort and avoid discomfort; afterwards, it's about delivering key messages, setting highlights which delegates can activate as the purpose, achieve outputs etc. Towards the end, organisers should ask for follow-up so that people can keep working on topics addressed at the conference. When organisers discuss this process with their team, they can see how to tweak the customer journey by examining each step of the customer experience, analyse it and observe what is happening with the delegate at each specific moment, aiming to improve the expectations which are low, by exceeding them and improving 'frustration moments'. Organisers can create the 'optimal experience' from all of the small individual elements on the consumer journey. Functional experience: functions are always there, but can we use them with creativity to bring more than just the function? For example, Falling Walls has a juggler on stage who is also a time keeper for speakers. Another example was using an AI algorithm for attendee selection. Falling Walls hosts a discussion circle with high-profile participants and places substantial importance on diversity, thus leading to them using an AI diversity maximising algorithm. Here, the diverse group of participants was selected by AI - a functional but also great experience. Controlled experience: must 'touch' people emotionally and leave a lasting impression. It should have an impact so that people want to do something about it. Here, the organisers used the alarming example of plastic that is eventually transported into the ocean and which affects living organisms in the ocean and its shores which eat the plastic. Falling Walls 'translated' this issue into the real world, placing an example of such plastic before the speaker. The mountain of plastic was so high that attendees couldn't see the speaker properly, thus leaving a long-lasting impression. Choice experience: when participants have a choice. Here, event organisers chose to give participants the choice of their 'water foot print' for lunch. 'How much water do you want for lunch?' read the slide, 'with one serving of pork roast with knödel and sauerkraut consuming 920 litres of water, and durum wheat and potato gnocchi with tomato and mangold ragout 110 litres'. Design for serendipity: considered the 'latest' tool, it means that organisers can create situations for attendees to meet by coincidence because there is a magic in unplanned meetings, for example while queuing for a coffee. By introducing a sign saying, 'it's not a coffee queue but your best networking opportunity', it can come to delegates' mindsets and facilitate spontaneous encounters. 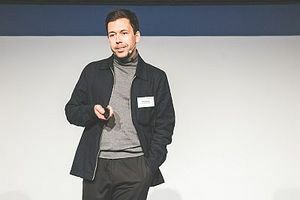 To conclude with a personal example, which Felix was particularly proud of, when they had organised the farewell dinner with a speaker who spoke about AI and computational creativity (the creativity of an algorithm). The organisers thought about what they can do about it and reached out to IBM in New York who developed the Watson programme, the algorithm that won against chess champions and the best Jeopardy game players. In the meantime, IBM has also developed Chef Watson to prepare meals. They got their cooks in Berlin together with IBM team to develop a menu that mixes the ingredients that best meet delegates' needs and preferences. The menu was designed by AI, but attendees requested something 'normal' for next year. To conclude, ask yourself: What event experience has moved you or impressed you in particular and why? Was it because of the people you've met there? Did the organisers do something particularly good? Did you have an urge to participate? To give back? We have to be clear regarding the purpose across all stakeholders. Everyone in the room must understand the purpose and goals of the event. 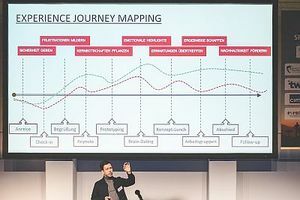 An event is a chain of experiences; therefore, think about the participant experience journey and how can you tweak it. Then, consider the overlay of experiences for long-lasting impressions, how can you surprise your delegates with experiences that they don't expect, and don't be afraid to experiment outside of your comfort zone. And lastly, don't be modest with your purpose - set your purpose high and be ambitious to transition from the old event world to the new event world. Irina Graf ist Gründerin von The MICE Blog, einem internationalen Event-Management-Blog für Corporate Event Planer, der 2011 ins Leben gerufen wurde. Sie arbeitet mit globalen Kongressbüros, Veranstaltungsorten, Veranstaltungsplanern und Ausstellungsorganisatoren, um diese bei den Themen soziale Medien, strategische Erstellung von Inhalten, Live-Blogging, FAM-Trips und gesponserten Beiträgen zu unterstützen. Seit Juni 2018 ist Irina Graf auch als International Relations Officer beim Verband der Veranstaltungsorganisatoren eV (VDVO) tätig.